I have heard of the 1977 adaptation of A.E.W. Mason’ 1902 adventure film. But I never thought I would see it. Recently, it occurred to me to rent the movie from Netflix, because I have yet to run across it at any store that sells DVDs. I did rent “THE FOUR FEATHERS”. Needless to say, it produced some rather interesting feelings within me. Anyone familiar with Mason’s tale knows that “THE FOUR FEATHERS” is the story about a 19th century British Army officer named Harry Faversham, who harbor plans to resign from his commission in the Royal North Surrey Regiment and live out the rest of his days with future wife Ethne Eustace. During a ball held at his family estate, telegrams for Harry and three of his friends – Jack Durrance, William Trench and Thomas Willoughby – ordering them to report for duty, due to their regiment being shipped out to the Sudan to participate in the Mahdist War. Being the first to receive the telegrams, Harry had them destroyed so that he would not have to report for duty a day before his resignation from the Army was due to be official. Realizing what Harry had done, his father ostracized him, his three friends gave him white feathers that labeled him as a coward, and Ethne breaks off their engagement and also hands him a white feather. Also, Harry’s best friend, Captain Durrance, becomes a rival for Ethne. Haunted by his efforts to avoid combat, Harry travels to the Sudan to help his friends any way possible and return their feathers. “THE FOUR FEATHERS” attracted a good deal of critical acclaim, after it aired on British and American television. The movie also earned a Primetime Emmy nomination. And if I must be honest, I find that particularly surprising. I have seen this movie twice. Granted, it seemed pretty decent as far as television movies go. But . . . an Emmy nomination?“THE FOUR FEATHERS”? It just did not strike me as being that memorable. The Wikipedia site claimed that it was a very faithful to Mason’s 1902 novel. Actually, it was no more faithful than any other adaptation I have seen. But I do feel that the movie’s critical acclaim might be overrated. The movie can boast its virtues. “THE FOUR FEATHERS” provided a small, but detailed peek into Harry Faversham’s childhood that gave audiences a good idea behind his aversion to continuing his military career. It also featured at least two excellent action sequences – the skirmish that led to the destruction of Durrance’s company and his blindness, and Harry and Trench’s escape from the prison-of-war camp at Omdurman. Dramatic scenes abound in the film, especially one that featured the breakup of Harry and Ethne’s engagement and the former’s final confrontation with his militant father, retired General Faversham. And I cannot deny that some very good performances were also featured in “THE FOUR FEATHERS”. David Robb, Harry Andrews and Robin Bailey all gave solid performances. I found Simon Ward’s portrayal of William Trench rather intense, but believable. Both Robert Powell and Jane Seymour were excellent as Jack Durrance and Ethne Eustace. Beau Bridges proved to be an enjoyable surprise in his portrayal of the lead character, Harry Faversham. I recall reading one review of this movie, in which the critic praised the rest of the cast, but put down Bridges’ performance. Apparently, he found the idea of an American portraying a Victorian British military officer unbelievable. I have seen Americans portray British characters before. And quite honestly, I thought Bridges did an excellent job by giving a subtle performance and avoiding histronics . . . unlike his performance in the 1976 film, “SWASHBUCKLER”. Yes, ladies and gentlemen. 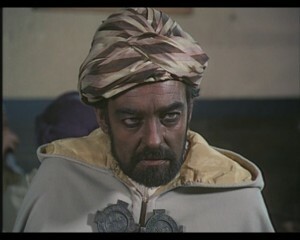 The above photo is an image of British actor Richard Johnson portraying a Sudanese Arab named Abou Fatma, who assists Harry in his efforts to save his friends. Johnson gave a nice, solid performance as Fatma, but . . . why? Why??? Why on earth did the producers cast Johnson in this role? He looked like a performer in a 19th century minstrel show . . . or a cast member from “THE BIRTH OF A NATION”. This kind of wince-inducing casting may have been common in the film industry during the first half of the 20th century. But “THE FOUR FEATHERS” aired on television around 1977/78. Nearly a year after the ABC miniseries, “ROOTS”. What in the hell were the producers and casting director Paul Lee Lander thinking? Do not get me wrong. “THE FOUR FEATHERS” is a pretty solid adventure movie that can boast a first-rate cast led by Beau Bridges. But I do feel that the movie is critically overrated. I did not find it that impressive, dramatically or production wise. I found the casting of white actors portraying non-white characters rather repulsive. And the movie’s sympathetic portrayal of the character’s anti-military stance in comparison to its pro-conservative portrayal of British imperialism struck me as hypocritical. Still . . . it was not a bad movie.